As always, all thoughts, feelings and opinions towards this group and their music is totally my own and no one else's. Don't like it, don't read. Simple as!!! The fact that I have yet to formally introduce you guys to Juliet, as well as dedicate an entire review to this wonderful trio, is a crime! I mean, I have loved this group for a while now, so I am kind of questioning why I have yet to actually write about them... actually, saying that, let's write about them today! Okay, so I have actually talked about this group before, but only briefly. Last year on my 11th Digest, way back when that thing was new and still turning into what it has become now, I looked at the group and what was then their latest single, Daisuki. I was still relatively new to the group and trying out their sound and style. Needless to say, I have fallen in love with them more since then. So, given that a year has passed and all that jazz, I will give a brief re-introduction to Juliet right here and right now, just so that we know who they are, and to allow you all to take in a bit of information about this group before I delve into the Review. 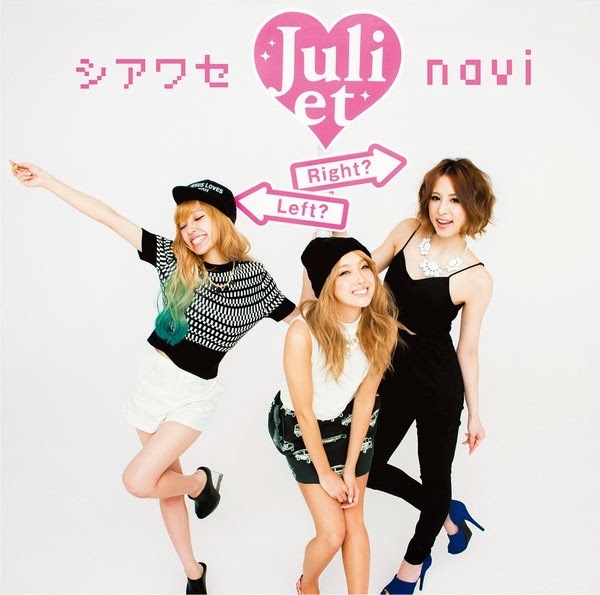 Juliet is a pop-R&B trio that was created back in August 2009, and is made up of three former Gyaru models; Hami, Maiko and Yumi. The girls debuted with the single Natsu Love, which reached #1 on the Recochoku ringtone charts and #24 on the Oricon. Since then, the girls have gone on to release 16 singles, 4 albums, 1 mini-album, 1 Best album and 13 Digital singles. They have also had their songs appear on various compilation albums. So as you have probably guessed, Juliet are not an Idol group, but in fact a very talented trio of pop-R&B artists. Yes yes, I know... I am kind of branching out a bit within the music field, rather than sticking to the status quo of cutesy Idol music, but I can't help it! I love music, whether it is pop or rock (seriously... I do like rock sometimes. HALLOWEEN PARTY, anyone?) and Juliet is one of those groups that I can't help but love. They have great music, and their voices are just wonderful... also, they have looks to die for! I guess that comes with being former models though, aye? That all said and done though, let's take a look at Juliet's latest single release, Shiawase Navi. Will you Navigate me to Happiness as we listen to this single? The title track of the single, Shiawase Navi is an up-beat, happy tune that deviates from the usual tone of their singles. No strangers to mellow tones or ballads like Sotsurenka or Daisuki, this is a pleasant change from the usual sound that we are used to Juliet creating as an A-side track. When I first heard this song, I was surprised by the up-tempo, carefree sound that it portrayed. I am rather used to songs like Daisuki and 23:45 by Juliet, so to hear something so cheerful and energetic from the group was different, but it was extremely refreshing as well. It is nice to hear how cheerful and alive the members sound in this song. Now, I'm not saying that they don't sound alive or cheerful in other songs, because they do, but this is such a new sound for them that it really changes the feeling of the song for me, and it just sounds so great to hear the girls take on this kind of song. The interval of the song, however, is completely different to the rest of the song. It's slower, with only a guitar to accompany the girls as they sing before slowly rising back up into that energetic song that we have come to enjoy. For a brief moment, we do come back to the sound that Juliet do so well, but we are quickly reunited with the burst of fresh air that Shiawase Navi is. It's a pleasant change, and really focuses on the vocals and the emotion behind the girls' voices, and it is probably the most amazing part of the song for me, because you can really hear how happy and satisfied the singers, especially Yumi, sound. They relish that moment, and you can really hear it in their voices in my opinion. As a song, Shiawase Navi is such a fun sound to listen to. It is definitely a change from what we usually hear from Juliet, but it works wonders for them. This song really allows us to see Juliet in a more energetic and carefree light, and allows us to listen to a more poppy tune that we aren't used to hearing from them. It is a great song, not only to listen to, but also to sing along to. I can really see this becoming Juliet's crowd song, one where fans can chant and sing along to during the chorus and opening points, because it is the sort of song that you can really get involved in when you hear it; the backing vocals allow for that, and with a song as lively and energetic as Shiawase Navi is, this would be a great song to really liven up a crowd when performed live. Namida is the coupling track to Shiawase Navi, and returns to a more familiar sound that I have grown accustomed to with Juliet. It is a slower, more ballad-like sound that really focuses on the beautiful voices of the members and the unison of their amazing vocals. The opening of the instrumental for Namida is absolutely beautiful, however once the vocals kick in it quickly changes. Honestly speaking, I am not a fan of the sudden change; it sounds far too rushed and is out of place, and the new sound is not my favourite. Thankfully, the song picks up after this for the chorus and we are once again introduced a beautiful, powerful instrumental that is truly amazing. It sounds so sad but wonderful at the same time, and I can really hear the emotion in both the instrumental and the vocals. I absolutely love the chorus for this song, it just sounds gorgeous. I also absolutely love Juliet's vocals in this; all of the girls are amazing singers, and they really bring forth the emotion of the song and put so much power and emphasis behind it. They make this song sound wonderful, and I just love how the beautiful sound they create when they sing together. I swear, these three girls create magic when they perform together, and much like their other singles, they have once again created a beautiful track. Namida is a beautiful song, much like a good majority of the groups discography, and whilst I do not care for that one change in the pace and tone of the instrumental, I do think that this is a gorgeous song. It enhances their vocals and really brings forth how powerful the girls sound together. It is a lovely song, and one that everyone should check out. A beautiful contrast to the happy and delightful Shiawase Navi, but also a great song itself that could easily stand alone. I think that this is a great single. Both of the songs present are wonderfully composed and deliver different emotions that are clear to the listener, and are accompanied by the powerful and beautiful vocals of Juliet. They are both great songs in their own right, with Shiawase Navi being a happy and enjoyable song that speaks to the listener, whilst Namida is a more emotional and moving song that brings us back to the songs that we usually hear Juliet sing. Both of the songs are, in my opinion, strong and wonderful. They are both beautiful and are amazing to listen to, and I just can't help but fall in love with Juliet the more I listen to them. I do think, however, that Namida is the stronger track of the two, but that is probably because this is the sound that is associated with Juliet, as well as the sound that they are strongest in. That said, I do think that Shiawase Navi is a breath of fresh air for their discography. A change of pace is always good, and I feel that Juliet pulled off such a happy, energetic sound so well. It would be nice to see them venture into a more poppy, energetic sound again, even if I do prefer their more emotional, R&B sounds. It is a great single, one which you should give a chance. I think that Juliet are an amazing trio, one which needs to be heard and talked about more. They are beautiful, talented and wonderful, and this single is only one of many other great songs. Give them a try. You might just like them as much as I do.